Episode 10: "The Rajput Ruby"
The Majaraja and Majarana of Rajput have come to Charlie Chan to help them recover the famous Rajput Ruby necklace which was stolen during a visit to the Tower of London. The Majarana ia an American who is a native New Yorker. She tells Barry Chan that her father owns a percentage of the Brooklyn Dodgers baseball team. The Majaraja is offering a $25,000 reward for the recovery of the ruby, but, refusing the reward, Chan agrees to take the case because it is of interest to him. The Majaraja adds that Scotland Yard has recommended the services of Chan to protect their belongings when the couple visit Paris later that week. It seems that their previous private detective, Joe Rotella, was fired by the Majaraja as they had been the victims of theft on three occasions over the past year. Visiting the Tower of London, Chan and Barry learn from a Scotland Yard inspector that a thorough search of everyone who was in the Tower when the ruby disappeared proved fruitless. Also, nothing was found after a search of the Tower itself. The question remains as to how the Rajput Ruby was taken out of the Tower. To that, Chan states that to find the answer, "must ask thief who stole same." Returning to their hotel, Chan and Barry run into an American who, Barry later tells his father, is Lefty Ryan, a baseball player who was once very popular in Brooklyn, but whose bad temper eventually led to the end of his career. Upon entering their room, Chan and Barry find Joe Rotello. Rotello blames the Majaraja for the recent thefts of his valuables. He adds that before marrying the Majaraja, Ida Kelly was just "a pretty kid in Brooklyn." However, the Majaraja's wealth has now gone to her head. When asked about the Majarana's father, Rotella notes that he might sell hotdogs for the Dodgers, but that would be his only connection to the team. Rotella tells Chan that he will be leaving London for home, but it is soon obvious that he had other plans. Chan feels that Rotella may be staying in London in order to recover his lost reputation by finding the stolen ruby. However, Barry feels that Rotella may have a romantic connection with Ida. Using a hotel pass key given to him by Rotella, Barry searches the private detective's room at the hotel, finding torn-up photographs showing that Ida and Lefty Ryan were obviously romantically involved. 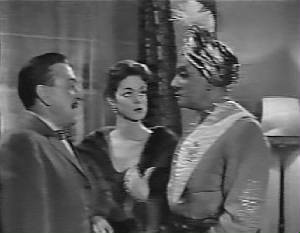 Later, Evans comes to Rotella's room, threatening him if he does not give him a half cut of the Rajput Ruby, although Rotella claims to know nothing of the ruby. Soon, Chan and Barry enter Rotella's room, finding the detective unconscious on the floor. Claiming he was drunk and had fallen down, knocking himself out. As a doubtful father and son leave, Rotella retrieves the Rajput Ruby from where he had hidden it. Later, the Majaraja explains to Chan that his wife was once engaged to Lefty Ryan. It seems that Ryan has been following the couple on their journeys. Meeting with the Majarana, Chan tells her that it was actually she who had stolen the ruby, knowing that she would not be searched. Chan adds that the ruby was stolen in order to pay off a blackmailer – Rotella – who was being paid off to keep silent about her continuing affair with Lefty Ryan. Meanwhile, Rotella has taken the ruby to Jan Dikker, an unscrupulous diamond cutter. Barry, who was following Rotella, is captures at Dikker's shop by Ryan who reveals that he and Rotella are now "partners." Responding to a pre-arranged telephone call from Barry’s taxicab driver, Chan arrives at Dikker's shop. Breaking in on and surprising Ryan and Rotella who are holding Barry, father and son overcome the pair and hold them for the authorities. Mr. Kramer (to Charlie Chan): "When I saw a news story that you were in town working on some cases, I called you." First sign of age when man cannot tie shoe from standing position. Secret romance like dead ant in pepper pot - very often difficult to detect. Sometimes being half right makes for being half wrong. On many occasions ethics prevent private detective from divulging secret. Secret, when told to another, is no longer secret. Old romance, like cat, sometimes has nine lives.